The platform chemical adipic acid is used to derive polymers, pharmaceuticals and agrochemicals, products worth several billion euros a year. So far, the compound is only accessible from fossil raw materials with high energy input. Therefore, there is a great interest in biologically based adipic acid for which there is no competitive, industrial process, yet. 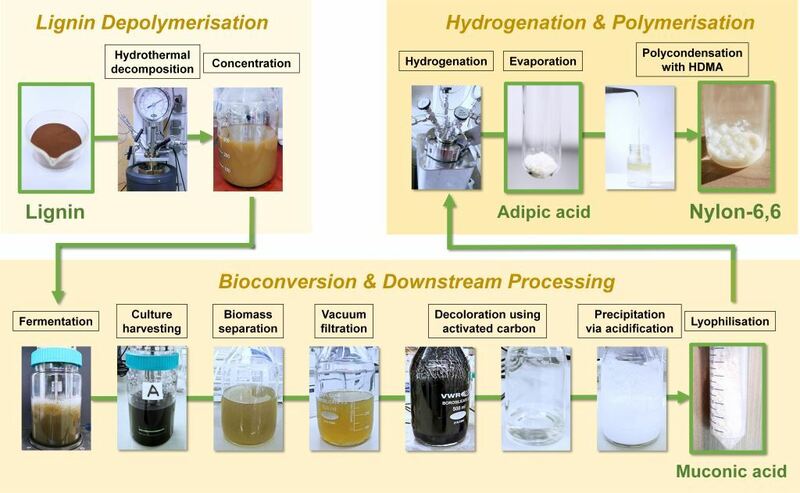 The project Bio2Nylon is researching a novel production concept for bio-adipic acid, which uses aromatic compounds as starting materials. With low energy costs, it aims at the novel, direct use of the lignin waste material, which is obtained in large quantities in the cellulose and hemicellulose production from lignocellulose and so far offers little possibility for recycling. Thus, the new process allows a considerable environmental protection compared to existing petrochemical routes. The project will be funded by the German Ministry of Education and Research (BMBF) as part of the VIP initiative. As associated partners, the energy research institute ECN (Petten, Holland) and the Leibniz Institute for Agricultural Engineering and Bioeconomy (Potsdam) are supporting the project in the field of raw material pre-treatment and the scaling of the new process to pilot scale. Kohlstedt, M, Starck, S, Barton, N, Stolzenberger, J, Selzer, M, Mehlmann, K, Schneider, R, Pleissner, D, Rinkel, J, Dickschat, JS, Venus, J, van Duuren, J, Wittmann C (2018) From lignin to nylon: Cascaded chemical and biochemical conversion using metabolically engineered Pseudomonas putida. Metab. Eng. 47:279-293. Link. Barton N, Horbal L, Starck S, Kohlstedt M, Luzhetskyy A, Wittmann C (2018) Enabling the valorization of guaiacol-based lignin: Integrated chemical and biochemical production of cis,cis-muconic acid using metabolically engineered Amycolatopsis sp. ATCC 39116. Metab. Eng. 45:200-210. Link. Becker J, Kuhl M, Kohlstedt M, Starck S, Wittmann C (2018) Metabolic engineering of Corynebacterium glutamicum for the production of cis,cis-muconic acid from lignin. Microb. Cell Fact. 17:115. Link.